Some seldom-used words have a particular charm: their meaning is clear simply from their spelling or the way they sound. “Rapscallion” is one of them, already noted in this series; who can’t help but think of “a mischievous person” and imagine Johnny Depp in pirate garb even before looking the word up in a dictionary? Kerfuffle is another. Does a commotion, controversy or fuss come to mind? That’s what it is. The word began as “fuffle”, a 16th-century Scottish-English verb meaning to “dishevel”, with the prefix “car” added later, possibly originating from the Gaelic-Scottish word for “wrong” or “awkward”. 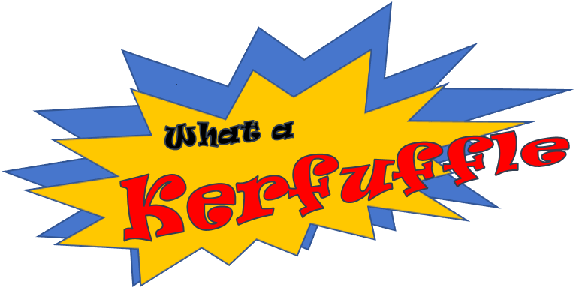 Over the centuries it was spelled “curfuffle”, “cafuffle”, “cafoufle” and “gefuffle”, until the “kerfuffle” spelling stuck in the 1960s, according to Michael Quinion on World Wide Words. The popular spelling may have derived in imitation of such constructions as “kerplunk”, where the prefix ker- serves to add emphasis. A word not used much today, its synonyms include “bruhaha”, “fracas”, “hubbub” and “hullaballoo”, although they’re not so common either and equally broad in meaning. Simpler equivalents, but not as wonderful, are “mess”, “disorder” or “to-do”. A kerfuffle is often a situation that’s overblown or one that receives more attention than it deserves. In its definition, Oxford Dictionaries adds that it’s especially caused by conflicting views. US President George W. Bush’s use of the term in 2006 caught the media by surprise largely because the word fit the president’s uncommon knack for turning language in curious ways. One media source explained: “Some of the president-watchers on duty in the press gallery had to stop in midstory and explain to America this novel new word [kerfuffle] from the man who gave us ‘misunderestimated’.” Chris Christie, former Governor of the US state of New Jersey, recently called the media’s coverage of a controversy over a US judge with Mexican heritage a “kerfuffle”. Even the debate over President Donald Trump’s use of “covfefe” in 2017 was cited by NPR.org as the “covfefe kerfuffle”. With people increasingly airing their opinions via social media, easily starting conflicts or spreading rumors, kerfuffle will no doubt grow into the quintessential term to describe a commotion or disturbance. Or are we making too much of a kerfuffle over kerfuffle? Only time will tell.